Last night, Indiana Street in Elmhurst looked like a winter wonderland. With the big snowfall, we went out to clean the sidewalks and driveway and while I was out there, I snapped this photo of our Front Yard Tree. 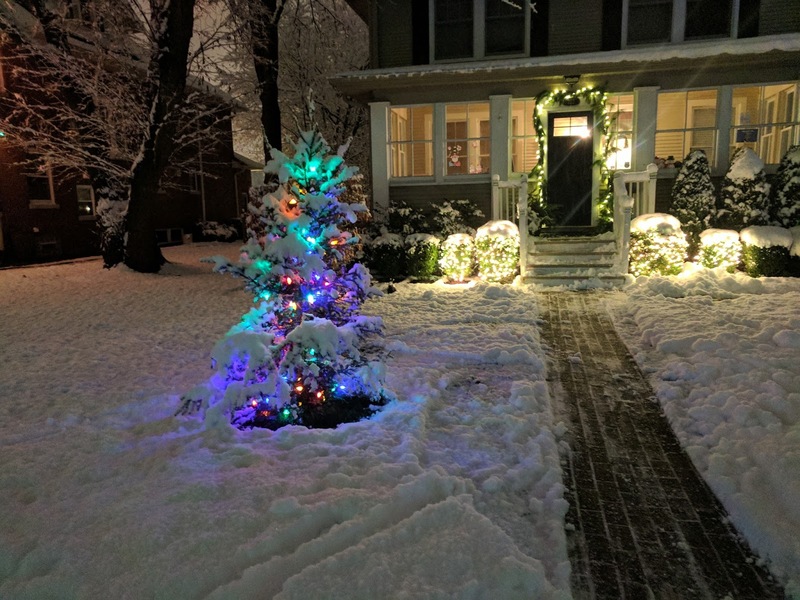 This is the seventh Elmhurst Front Yard tree that I've posted on the blog and the second one in front of Vic and Equation Boy/Man's house down the street from our old place. Although you may not be able to tell, this year's tree is a really nice-sized tree in terms of height. I put one strand of C9 LEDs on it, but Nat didn't think it was bright enough, so she went out and picked up two more strings of C9 LEDs and now there's 150 lights on that thing. Here's the post showing our 2015 tree out front of Equation Boy/Man's house. Here's the post from our 2014 tree out front of our old house (sad face). There's no snow in the photo of our 2012 tree.